So I feel a bit like “I’ve been gone and now I’m back”…hello again! 🙂 It’s been such a busy several months. Kids are in more and more activities, busy with church, new job, garden…the blog has taken a back seat. I’m thankful for a Facebook friend who has refueled my love for homesteading…and I thought I’d share some videos that he has shared with me. This one is cool…fishing in their man made pond. I’m wondering if any readers have done this? We have 10 acres near where we live, and I’d like to tackle this as a project one of these years. We are surrounded by farmland though, and I’m speculating as to what ickiness would eventually work its way into the pond if we did such a thing. If anyone has personal experience or input, I’d like to hear it. Almost mid-February….AND I’M ITCHING TO GARDEN. We are looking into a couple of potential new gardening ventures, and I had the “Back to Eden” documentary recommended to me by a fellow Christian gardener. I thought I had it on You Tube, but as it turns out, I only had the “Garden Tour”. He has a lot of wisdom about what I’d call Biblically-inspired gardening and homesteading, and makes some really great points that I had never given thought to before based on Creation. He is also an advocate for no-till gardening, which has intrigued me for awhile, so I’ll be watching more of You Tube videos about him and his methods. I haven’t checked it out yet myself, but if you’re interested I believe you can watch the original documentary on the website/link given at the top of this post. The countdown begins to seed starting in the house…one more month!!!!! Woot woot! I can’t wait till’ we have chickens in town. 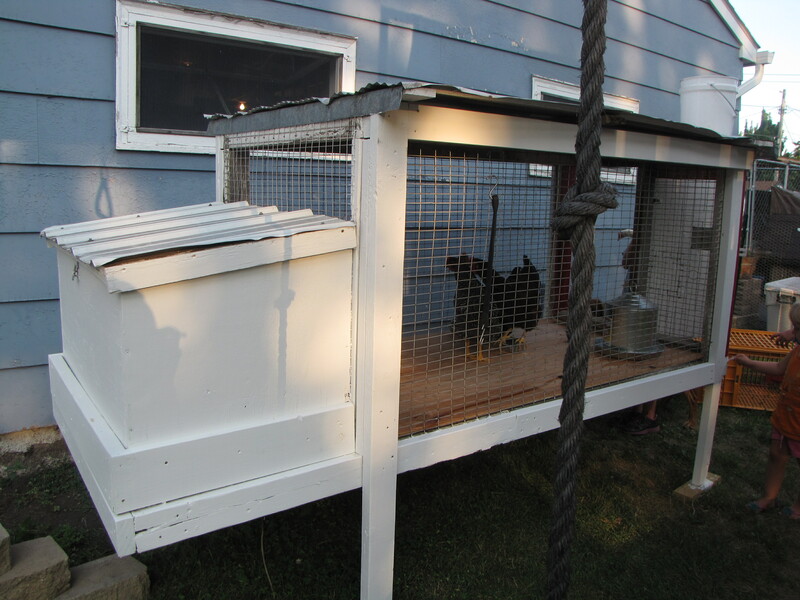 My 2 younger siblings, my mom and dad, and I get to fix and pizazz the chicken coop. So excited!! Anyway, we also get some advantages with the fully developed chickens. What, you say? 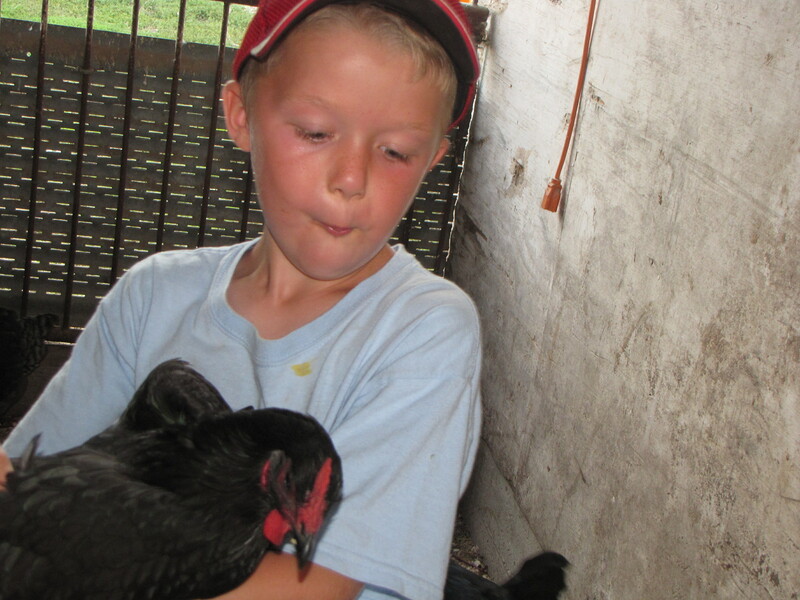 Well, we get free eggs, something to hold, pet, and study for 4- H. I love to hold the chickens (as long as they don’t poop on me!) One of the big chickens at my grandpa’s farm lets you walk right up to it and pick it up and hold it. 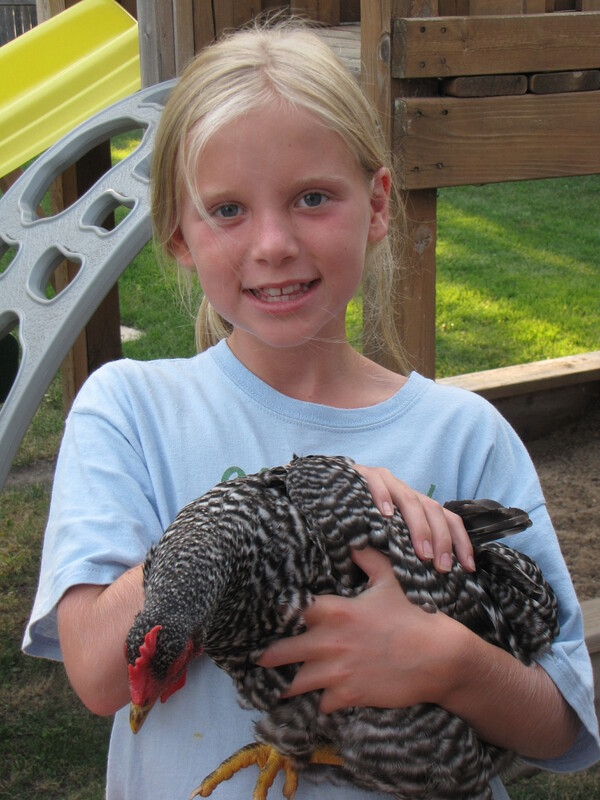 Tips for holding chickens – When you grab them, hold their wings down and put the head under your arm so you can see it on the other side. 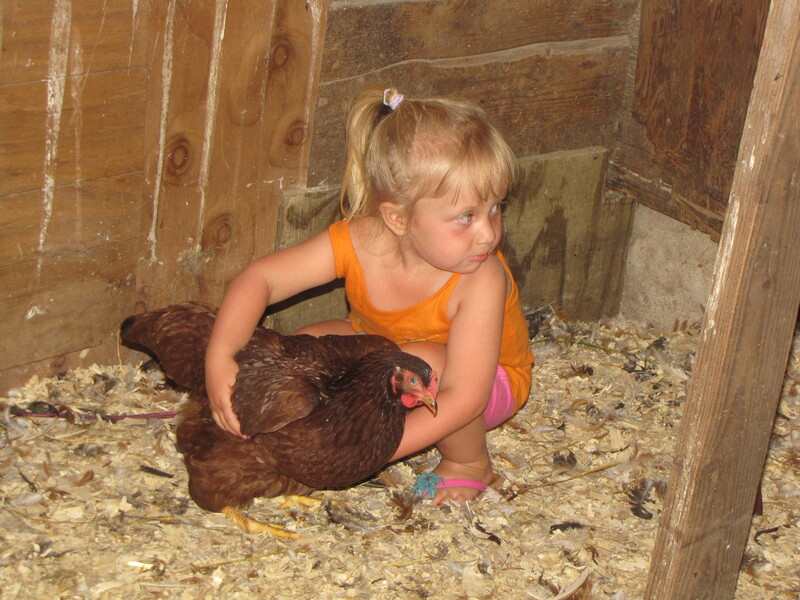 Put your hand under their backside, and remember to stroke the chicken’s back so it knows it is okay. If you are new to this, you should go for one that is slightly big, and a female. Roosters (males) are a bit scary and aren’t as calm as females. Recently, my little 3 year old sister caught her first chicken! YAHOO!! Last year I won grand champion at our county fair’s poultry show, and I’m looking forward to practicing with these “classy chicks”! I am very excited for my feathered friends to move into town. A note from the Earth Muffin Mom: This move was not without drama. The hens…well…didn’t exactly like each other right off the bat. We never gave this thought because they had all been together since they were a few days old. 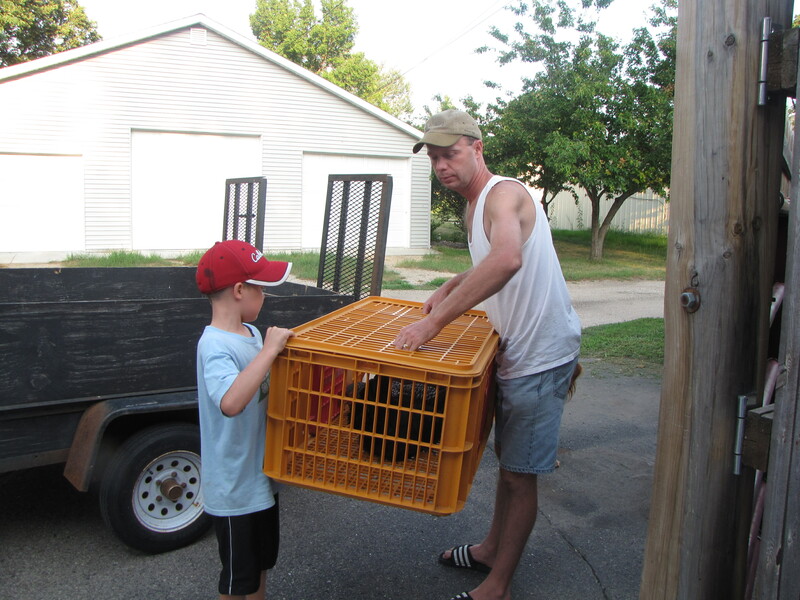 The first day, we brought four hens to town. It was painfully obvious by the end of the second day that the three bigger hens had ganged up on the fourth smaller white leghorn (Miss Toot). We had a little lesson in chicken psychology – who would know that hens would be bullies in such a planned manner? The three hung together in a pack, they would not let Miss Toot out of the hutch area, they wouldn’t let her eat or drink, and any time they got the chance they would peck at her head. She would hang her head and dodge back into the hutch. It was really sad to watch – frankly I felt like I was reliving high school in a weird sort of way! We decided to bring in three more white leghorns just like Miss Toot. At first, it was total Chicken Solidarity. The four white leghorns seemed to stand up to the three big hens. For the first day. The next day we realized that those three big hens weren’t letting the four smaller hens out of the hutch, or letting them eat or drink. They continued to peck at their heads and feathers. Right about the time we were ready to take those three hens back to the farm…they all seemed to have some sort of epiphany and are now getting along beautifully. Don’t know what exactly happened…perhaps they really did understand my threats about ending up in my stock pot???!!? Our town has an ordinance against having farm animals in town. We were quite happy to get a special use variance since our kids are in 4-H. 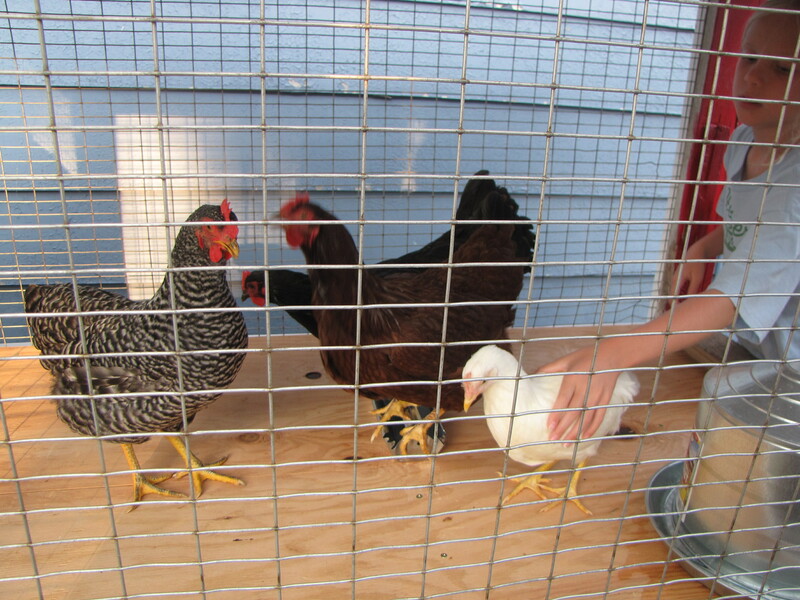 The hens are considered “show animals” since they’ll all be making an appearance at the county fair. Aside from 4-H, I have my reasons for wanting them here. I can choose their care, and having them here, my kids can do chores and care for their own animals which is great. I wish they were grass fed, but our yard is small and it isn’t allowed through the variance that we got anyhow. But…I can feed them all of my kitchen scraps that would otherwise be compost and they are out in the fresh air getting sun (can you say…Vitamin D egg yolks???). I love walking outside and picking fresh eggs… Considering that we go through five to six dozen eggs a week…this is a no-brainer!!! 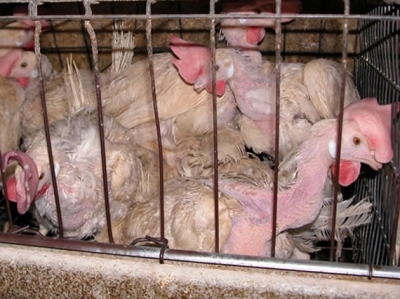 Chickens in this type of industrial farming conditions (known as battery cages – which according to Wikipedia accounts for about 60% of the worlds eggs) often have their beaks snipped without anesthesia. The reason that this is done is because living under these conditions, the birds go insane and will peck each other to death, and cannibalize the other birds. Now…I am not even remotely a vegetarian (although the book “Eating Animals” by Jonathan Safran Foer did push me into a very brief vegetarian stint a few years back)…but I don’t believe that what I eat should live or die badly to end up on my plate. I encourage you to do your own research on this subject, and not take my word for it. I try my best to purchase humanely raised meat from local farmers that I know…and also to keep our own chickens for fresh eggs. Seriously, who would want eggs from these poor things????? Our girls have been a blast to have (although I could do without the flies)! A couple are even tame enough already that they like to be petted. 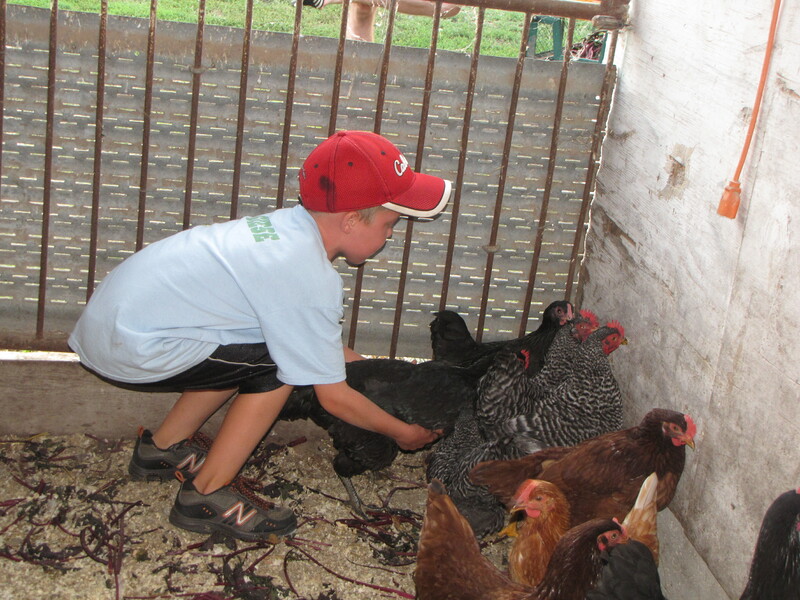 We like watching them “expressing their chickenness” (to coin a phrase from my favorite farmer/author, Joel Salatin). They make great pets, and I think that the chores are a good way for the kids to see outside their own needs. It sure beats watching TV! If this interests you, check it out! 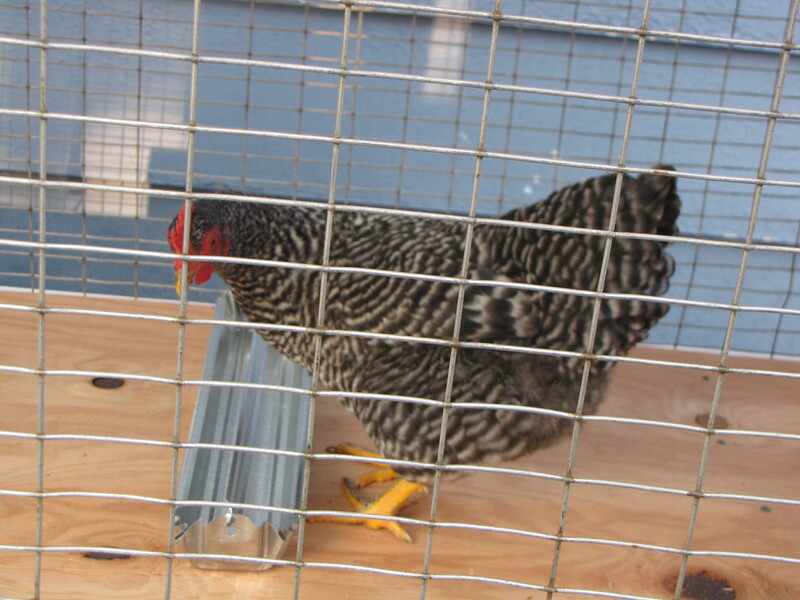 If your city has some type of farm animal ordinance like ours…talk with your city officials to see how you can keep backyard chickens. Maybe they would be willing to change an existing ordinance if there is enough interest. Even a couple of birds would reap big rewards for their owners! This post was shared on the Healthy Home Economist’s Monday Mania; The Morris Tribe’s Homesteader Blog Carnival; Real Food Forager’s Fat Tuesdays; Cooking Traditional Foods Traditional Tuesdays; Better Mom Mondays Link Up; Prairie Homestead’s Homestead Barn Hop; Like a Mustard Seed’s Living Green Tuesdays; Kelly the Kitchen Kop’s Real Food Wednesdays; Frugally Sustainable’s Frugal Days, Sustainable Ways; GNOWFLINS Simple Lives Thursday; The Nourishing Gourmet’s Pennywise Platter; Real Food Freaks Freaky Friday; The 21st Century Housewife’s Gallery of Favorites; Too Many Jars in My Kitchen’s Fill Those Jars Friday. Premeditated Leftovers Gallery of Favorites.